As a staple for any bathroom, these cotton wool balls offer the ultimate in versatility. Pair them with cleanser or toner for a fresher complexion or perhaps put them to use removing stubborn nail polish. This pack contains around 100 individual balls and as part of the essential Waitrose range it delivers all the value and quality you'd expect. essential Waitrose Cotton Wool Balls. 100% pure cotton balls. approximately 100 balls. 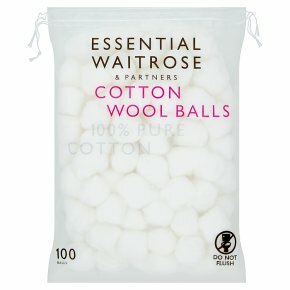 essential Waitrose cotton wool balls are specially made from 100% pure cotton making them ideal for removing traces of makeup and can also be used as part of your skincare cleansing routine. This product is manufactured using natural fibres and therefore may occasionally contain small pieces of cotton seed, husk or stalk To avoid danger of suffocation, keep this bag away from babies and children.